We are a Non-Denominational, contemporary Church that is open to all people of all different backgrounds- we are all unified as Christ calls us to be. From the time you walk through the doors, our prayer is that you feel welcomed and loved. We serve coffee and donuts until service starts at 10:30AM. At the Hub you can find information on upcoming events, ways to serve, financial information and more. Children’s Church Check-In begins at 10:15AM and instructions can be found here. Our worship is loud. A full band featuring 2-3 electric guitars, acoustic guitar, drums and bass- and occasionally a choir. We typically sing 3-4 contemporary songs, unless the Spirit leads elsewhere. We do not hold a rigid schedule, we may release anywhere from 11:30-1:30. We have 2 pastors which each have a particular preaching style. 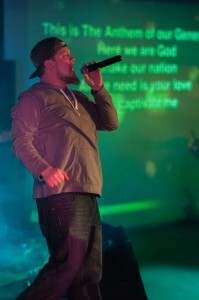 Pastor Josh has a modern, classroom teaching approach and a sample can be heard here. Pastor Earl leans toward an evangelistic-story telling form, a sample can be heard here. All sermons are uploaded each week and can be found on the “Media” tab.